HVAC Solutions offers a comprehensive service to the HVAC industry. From pre-commission chemical cleaning of pipework systems to testing and balancing of all types of air and water systems. Our commissioning processes are carried out in accordance with the current CIBSE and BSRIA commissioning codes of practise, all to the high standards and acceptable tolerances that you and your client would expect. HVAC Solutions offer Commissionability reviews. This service should be considered prior to the tender documents are released. Here, we can review the proposed drawings to see if the designer has included commissioning components within his or her design and that they are correctly located and sized for accuracy and authority. Referred to in other parts of the world as Commissioning Management. 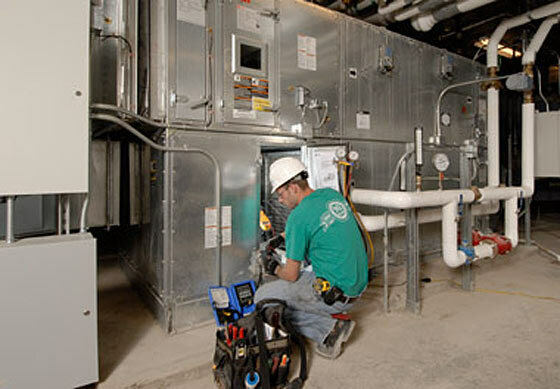 With every project being unique and every scope being tailored to suit that particular project, HVAC Solutions can either be the eyes and ears of the client, reporting back the progress on site, through to a full blown management of the commissioning specialist, orchestrating the entire commissioning process of all of the building services trades and witness testing the operation of the final products. It is becoming more apparent that ductwork and their associated components significantly leak air before it even arrives at the intended work space. At HVAC Solutions we have the latest digital Ductwork Leakage Tester that clearly evaluates a Pass or Fail condition to any ductwork section. For failed ductwork sections, it allows remedial works to take place before the project advances too far and essential action is inaccessible. A worthwhile process for all classes ductwork installations, including low pressure ductwork. From pre-commission chemical cleaning of pipework systems to testing and balancing of all types of air and water systems. No ‘closed circuit’ pipework system should be put into operation without being chemically cleaned and flushed! This is a process that has evolved over many years and when this methodical process has been correctly implemented, it lends itself to greater system efficiency and fewer maintenance issues. Resulting in a prolonged building life and improved occupant comfort. This is the most common of all commissioning processes. In short, a procedure that equally distributes the air and water around the building to suit the designers requirements. However, we think that it’s a little more than that. Most systems are littered with latent problems and it takes an experienced Commissioning Engineer to identify and resolve these issues as they arise. At HVAC Solutions we have that experience to tackle these issues. At HVAC Solutions we are frequently approached by Building Contractors, Building Owners and even potential Property Buyers to report on the condition &/or operation of the air conditioning plant within the building. Our extensive knowledge, expertise and high-end equipment allows us to interrogate systems and report on the current conditions. We can also offer recommendations for system improvements and remedies where necessary. All our commissioning processes are carried out to the high standards and acceptable tolerances you and your client would expect. Established in 2010, HVAC Solutions was established due to the growing industry demand for more proficiently commissioned building services systems. HVAC Solutions specialises in various aspects of building services commissioning and as a company we are growing year by year as our increasing client base recognises the importance of efficient commissioned systems. © Copyright 2019 HVAC Solutions | Auckland.